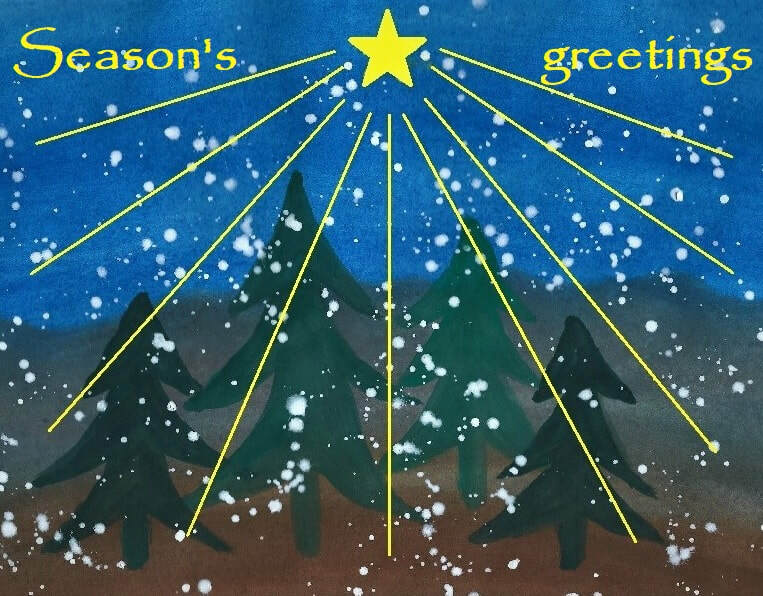 Season's greetings to you! Whatever holiday you celebrate at this time of the year -- Christmas, Chanukkah, Diwali, Winter Solstice -- in the Northern hemisphere, with it being immersed in the darkest period of the year, it is bound to be an invocation and celebration of light. So my wish and prayer for you, wherever you are, is that you may find and remember the light that you are, and that the peace of this remembrance may be with you always. And may you find a way of spending the holidays that is meaningful and truthful for you. As for the next meditation retreat day in Montreal, it will happen some time in January or early February. I will send a doodle for finding a date soon. I also had an inquiry after the last retreat day in early December whether I would consider doing a meditation retreat over a whole weekend. Would you be interested in that? If so, please let me know by commenting on this blog. I hope that you'll find time during the holidays to be quiet. 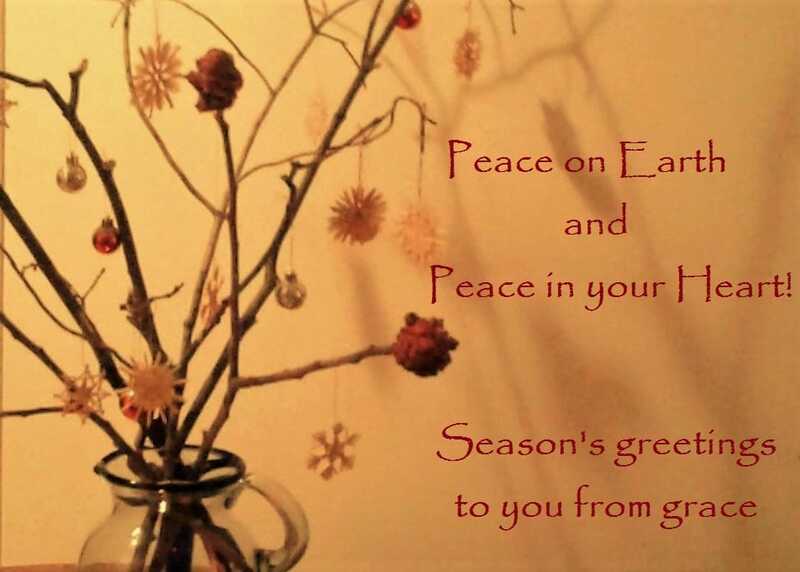 The holidays can be so busy, outwardly with activities and inwardly with thoughts and emotions being triggered. Meditation/quiet time will give you a break and be an occasion for remembrance. Depression is such a powerful state of emptiness and darkness that most people instinctively want nothing to do with it. Even just researching images for this blog post, I felt a gut tendency in myself to want to steer clear of this energy, to take a distance. This is true even when we are the ones who are depressed: we want to be rid of it, get away from it, or fix it somehow. In addition to the depression itself, there often arise shame about being depressed, self-blame about not being able to extricate ourselves from it, and fear about it continuing and/or coming back in the future. No wonder, then, that the use of anti-depressants is ever on the rise, as they promise a medical fix to the problem, so we don't have to deal with it any longer. This blog is an invitation to breathe and really look. If you don't follow the impulse to turn away, can you simply be with the energy that is expressed in the above photo? Can you notice what arises and stay with the image anyway: the fear of being pulled down or somehow being 'contaminated' by it, the repulsion, the blame? Can you simply look, neutrally, without any concept of what this is, why it's happening, and what needs to be done about it? Can you simply be with it? Can you open your heart to what you see? Can you see with your heart? What happens as you take your time, breathing, looking, being with this energy of depression, being with the man who is suffering with it? There's nothing like being back to a full-scale snowstorm and writing about one's trip to sunny and warm India! This photo is one of the most 'tourist-y' ones I have of my trip. Plenty of surprises in India, among them the fact that the charger didn't work for the digital camera I had borrowed, so I have no photos of my own. This photo was taken after I had 'taken a dip' in the Ganges, as Indians call it, referring to submersing oneself three times in the river so as to let it wash away all conditioning and karmic traces that obscure the light of our true nature. Fully dressed, in the case of women, in order to respect Indian custom. This was just one of many adventures -- most of them were more inner, though, such as going to see a number of spiritual teachers. The fall colors here in the Laurentians have been so incredibly vibrant, as if this year's summer heat was still lodged in the trees and colored them much more red and orange than I have seen before. It's a beautiful leaving present for me as I prepare to move to my new home close to Hemmingford, about an hour South of Montreal. It's an unsettling time, a time of many unknowns. A time where emotions can well up quite powerfully as a whole way of life comes to an end and morphs into a new form: from living by myself to sharing the new home with my dear friend Wendy, from being sheltered by the forest to living in a much more open landscape, from all that is well-known, familiar and reassuring to a life that is essentially unknown in its details and how it will all fall into place. Even though I trust this new turn that life is taking, it doesn't mean I move through it unrattled and unaffected. And at the same time, whatever happens, whatever gets thrown up, is simply food for learning, letting go, and expanding. Fall is the season of letting go. Are you allowing yourself to move with life's losses, with life's unpredictable twists and turns? Or are you resisting them, fighting, struggling, holding on? Let the trees inspire you as they let go of their leaves. Life's timing is not always our own -- the winds come when they do, and they will blow away the leaves of your life whether you're ready to let them go or not. Winter brings rest and inner movement, spring new outer movement, and summer great flourishing and ripening. What a beautiful rhythm our lives unfold in! What is it that has us all smiling at the end of a meditation evening, as in this photo taken earlier this summer? There is a mysterious synergy that happens when people come together to meditate. Somehow we all benefit from everybody else's mental focus and willingness to be here with whatever shows up in the simplicity of the inner space that opens up in meditation. It's not a space that we create, it's a space that we return back to from our forays into the endlessly busy world of perceiving, doing and thinking. This inner space is always there, inviting us into its stillness, simplicity, and beauty if only we take a moment to stop all outer and inner activity. You can do so by yourself, just by taking a few minutes, or a longer stretch of time, to sit, to breathe, to be still. Two weeks ago, Miriana, a woman who lives in Montreal, connected up with me. She had had an awakening earlier this year, but had not told anybody except her family. When awakening happens that powerfully, the energy transmits itself through the person and is a blessing and an invitation for all who come into contact with it. So I asked her whether she would be willing to share her experience and answer questions by people who are interested or feel called to be in her presence. This meeting will happen next Thursday evening, June 16, at 7 pm, in the office on 1533 Van Horne. You'll find the details HERE. It's interesting how many strands converge sometimes, to create a new movement into a new direction. It had become very clear to me recently that I was getting ready to offer events in Montreal that are a more direct invitation into Presence, or Being, than the meditation evenings. And 'coincidentally', I had been approached by a number of people who had found me through my online activities, asking whether I was offering anything in that direction in Montreal. This morning in meditation, the more concrete shape of this offering became clear: Meetings in Presence. No date is set yet for the first one, but I wanted to announce them as it's an exciting new direction that's opened up. Please get in touch if these would be of interest to you! These are ongoing, the meditation evenings every two weeks, the retreat days about once a month. I love inviting people to drop into being, through meditation and chanting. Check the Montreal Meditation meetup group for details. The next meditation retreat day will be on Saturday, 9 July 2016, 10 am to 3 pm. More details HERE. In this blog, I wrote about a session with a client, Clare, whose son was having a lot of trouble at school. When I posted it, decisions hadn't been taken yet, and the outcome of the story was open. Somebody wrote back to me about the blog and wanted to know what happened... and today, Clare sent me this photo of one of her son's doodles. He now thrives with being schooled at home. Happy heart ending! You can scroll down to find the blog (just below the previous one), or click HERE to read it. Celebrating what can be celebrated is one of the most joyful and inspiring things in our lives. During my recent visit in Germany, we (children, grand children and great grand children, with or without partners), came together to celebrate my parents' diamond wedding -- 60 years of marriage. The photo above is of my mother's colorful decoration of the lunch table with spring flowers and branches from her garden and chocolate lady bugs for the kids. It was a beautiful occasion. Such a lasting and loving marriage is not given to everybody, especially not all that often to the generations after theirs. There was sadness on my nephew's face because he had recently separated from his second wife. I am single, too, but due to everybody else's reluctance, it was up to me to give the speech that my parents felt belonged to such an occasion. In reflecting on this, I realized that my being single didn't stand in the way of my appreciating and celebrating their love and long life together. We all have experience of loving relationship in one form or another. We all know the moment-to-moment experience of our heart closing with conflict, disappointment or pain, and thus the challenge of keeping our hearts open, or daring to open them again. These are the most deeply meaningful and spiritually growth-full experiences of our human lives. And celebrating others in their loving relationship is inspiring for all of us, as it evokes the reality, truth and power of love in our own hearts. It's contagious and healing at the same time (except if we hold on to a belief that we're deprived, or not capable, of living it, which is not true, ever). And so the day was an occasion for all of us to bask in the glow of love. No doubt some of us took that in more fully than others, but all of us were touched by Love's grace, even my nephew for whom all of our hearts were beating with tender compassion. We were touched by my parents' love, which created our family, and our love for each other, including all the rough edges, of course! There is no human story without those, but there is also no human story without a touch of Love's grace. It's up to us what we choose to focus on.